General Electric (GE) originally manufactured the 8000 Series, 7700 Series, and the 7098 Series Motor Control Center (MCC) Buckets over the past three decades. Although Control no longer supports the GE 8000, GE 7700 and GE 7098 series MCCs, RESA Power can supply completely remanufactured General Electric Motor Control Buckets and related parts. 1.) 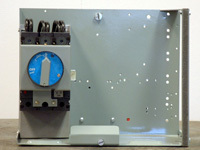 New Components: Although the General Electric 8000 Series, General Electric 7700 Series, and the General Electric 7098 Series MCCs were built decades ago, our rebuilt models are retrofitted with NEW components bringing your Motor Control Centers up to the latest technology without replacing the entire MCC. 2.) Cost: When a MCC Bucket fails, there are two options; the first: Go Rebuilt, the second: Go New. Going new is a headache as the failed bucket is not all that needs to be replaced. Because the MCC is no longer supported by General Electric, the bucket cannot be supplied new from the Manufacturer. The result: a complete changeout of the entire motor control center and as you can imagine, substantial associated costs and lead time. Opting to rebuild elimitates the cost and necessity for new infrastructure. In fact, we can supply a completely remanufactured General Electric MCC bucket with the latest components in as little as one week. 4.) Warranty: General Electric originally gave a full one year warranty with the GE Series 8000, GE Series 7700, and the GE Series 7098, so why shouldn’t we? We’re so confident in the overall quality of our work that we include a FULL one-year warranty with all of our reconditioned MCC buckets. 5.) Quality: Our staff of highly qualified, safety conscious, graduate engineers take the primary role in the remanufacturing process of General Electric Motor Control Buckets. Our 80 year old company’s experience is strongly reflected in the overall quality of our rebuilt buckets.